University of Iowa researchers have documented how cancerous tumors form by tracking in real time the movement of individual cells in 3-D. They report that just 5 percent of cancer cells are needed to form tumors, a ratio that heretofore had been unknown. Images courtesy of Soll Laboratory. Cancer is a mysterious disease for many reasons. Chief among the unknowns are how and why tumors form. 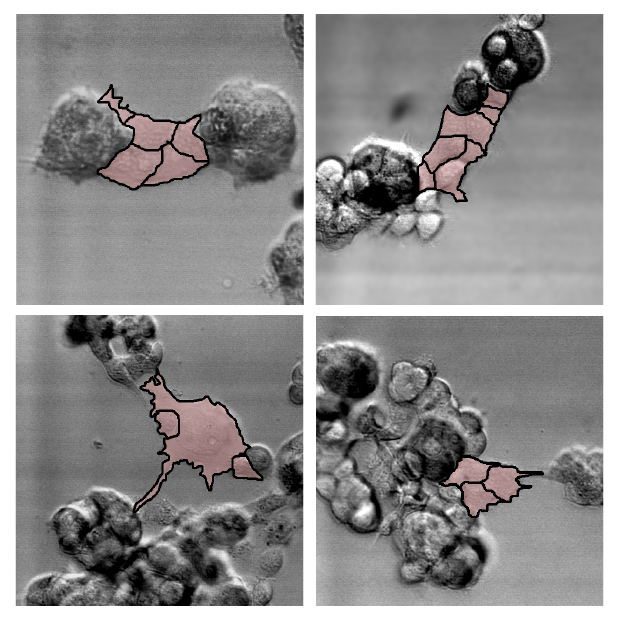 Researchers at the University of Iowa tracked in real time the movement of individual cells and cancerous breast tissue cells. The top video shows healthy cells. The bottom video shows how the cancerous cells extend and probe for other cells, then reel in cells to form ever-larger tumors. It’s believed to be the first time that tumor creation has been shown in continuous, real time. Video courtesy of Soll Laboratory. The team discovered that cancerous cells actively recruit healthy cells into tumors by extending a cable of sorts to grab their neighbors—both cancerous and healthy—and reel them in. Moreover, the Iowa researchers report that as little as five percent of cancerous cells are needed to form the tumors, a ratio that heretofore had been unknown. The findings could lead to a more precise identification of tumorigenic cells (those that form tumors) and testing which antibodies would be best equipped to eliminate them. Soll’s Monoclonal Antibody Research Institute and the Developmental Studies Hybridoma Bank, created by the National Institutes of Health as a national resource, directed by Soll and housed at the UI, together contain one of the world’s largest collections of antibodies that could be used for the anti-cancer testing, based on the new findings. Cancerous cells “recruit” cells into tumors by extending a bridge of sorts and reeling in both healthy and cancerous cells. The UI researchers documented the phenomenon for the first time in real time and in 3-D. Images courtesy of Soll Laboratory. In a paper published last spring in the journal PLOS One, Soll’s team showed that only cancerous cells (from a variety of cancers, including lung, skin, and aggressive brain tumors known as glioblastomas) engaged in tumor formation by actively soliciting other cells. Like evil-minded envoys, individual cancer cells extend themselves outward from the original cluster, probing for other cells in the area, the researchers observed. Once it detects one, the extended cell latches on and pulls it in, forming a larger mass. The activity continues, the cancerous extensions drawing in more and more cells—including healthy cells—as the tumor enlarges. The question is how these cells know what to do. Soll hypothesizes they’re reaching back to a primitive past, when these cells were programmed to form embryos. If true, perhaps the cancerous cells—masquerading as embryo-forming cells—recruit other cells to make tissue that then forms the layered, self-sustaining architecture needed for a tumor to form and thrive. Think of a Death Star that’s built up enough defenses to ward off repeated attacks. Or, less figuratively, how bacteria can conspire to create an impenetrable film on surfaces, from orthopedic implants to catheters. In the AJCR paper, the researchers compared the actions of human breast tissue cells (MoVi-10’) to a weakly tumorigenic, parental breast cancer cell line (MCF-7). First, they found that over a 50-hour period, MoVi-10’–only cells grew more in density, primarily by joining together, than did MCF-7. Also, in all instances, regardless of the ratio of MCF-7 to MoVi-10’ cells in the cluster, only MoVi-10’ cells reached out and drew in other cells—including healthy cells—to the growing mass. “The results here extend our original observation that tumorigenic cell lines and fresh tumor cells possess the unique capacity to undergo coalescence through the active formation of cellular cables,” the authors write. Soll’s team also discovered that the Mo-Vi10’ cells move at 92 microns per hour, about twice the speed of healthy cells. That’s important because it helps scientists better understand how quickly tumors can be created. Contributing authors, all from the University of Iowa, include Joseph Ambrose, Michelle Livitz, Deborah Wessels, Spencer Kuhl, Daniel Lusche, and Edward Voss. Amanda Scherer, now at the University of Michigan, also contributed to the research while at the UI.